Please join us for our Annual Vegan "Gentle Thanksgiving" Feast on November 21st! Our event is featured in the November issue of Change Magazine! Many thanks to our event sponsors: Radical Eats and So Delicious! 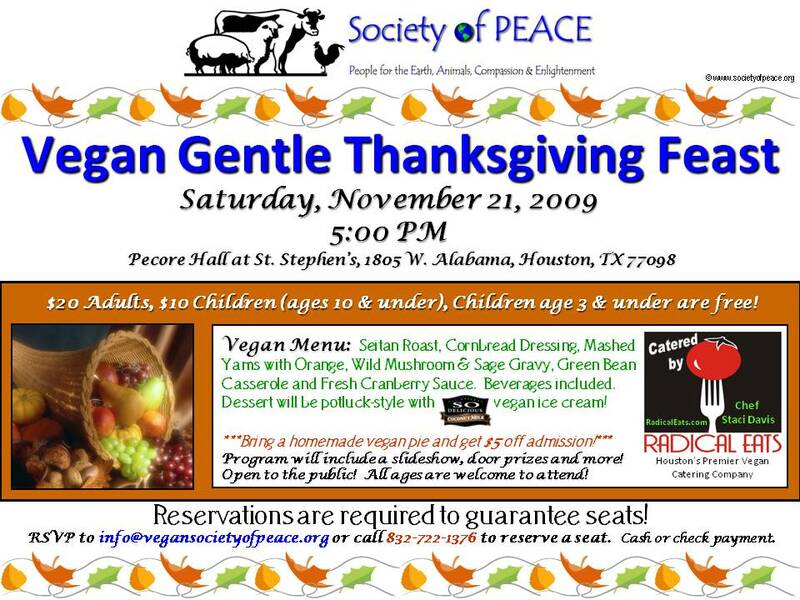 Join us on Saturday, November 21st at 5:00 PM for the Society of PEACE Annual Vegan "Gentle Thanksgiving" Celebration. We've reserved Pecore Hall (inside St. Stephen's) to accommodate even more attendees this year! All ages are welcome to attend! Our delicious vegan feast will be catered this year by chef Staci Davis, owner of Houston's premier vegan catering company, Radical Eats. (She's also a member of Society of PEACE!) Our gourmet vegan menu includes: Seitan Roast, Mashed Yams with Orange, Wild Mushroom & Sage Gravy, Cornbread Stuffing, Green Bean Casserole, Fresh Cranberry Sauce & Iced Green Tea. This year, dessert is potluck-style! Bring a homemade vegan pie to share and get an extra $5 off admission! And, we'll be serving up vegan ice cream from So Delicious to go along with tasty pies. We'll also have a special Society of PEACE slideshow (send us your pictures! ), great door prizes, Veg Starter Guides, vegan product coupons for Tofurky, So Delicious, Lightlife and more! We're excited that our event is also mentioned in the November issue of Change Magazine -- look for the article about Farm Sanctuary's Adopt-a-Turkey program! Please remember that reservations are required for this catered event! You can RSVP to info@vegansocietyofpeace.org, or call/text the Society of P.E.A.C.E. line at 832-722-1376 through Nov. 19th! Seats are filling up quickly. If you've already made reservations, you'll receive confirmation via phone, email or text this week. We hope to see you there! Many thanks to our wonderful event volunteers and to our sponsors: Radical Eats and So Delicious! Join members of The Woodlands Vegan Meetup and the Houston Vegetarian Meetup for a joint Social Lunch. This month, both groups will be meeting for vegan pizza at Pizza Fusion in Houston. The lunch begins at 2:00 PM. For more information and to RSVP, visit The Woodlands Vegan Meetup online. Society of PEACE member Michelle is the organizer of this meetup group and can be contacted through the website. Vegan Cooking Class: "Versatile Tofu: The Meat & Dairy Alternative"
Leisure Learning Unlimited presents "Versatile Tofu: The Meat & Dairy Alternative", featuring vegan personal chef & KPFT radio personality (and Society of PEACE member) Staci Davis. The vegan cooking class is on Sunday, November 22, 2009 from 3:00 - 6:00 PM in Sharpstown area (SW Frwy at Fondren) in Houston. Staci will teach you how to make chipotle chili, vegetable lasagna, silk pies, bread pudding and much more. The cost of the class is $52 and includes the meal. For more information and to register, CLICK HERE. Participants must register in advance through Leisure Learning, as class size is limited! Members of HART (Houston Animal Rights Team) will be meeting in downtown Houston to hand out leaflets at the annual Thanksgiving Parade. They will be congregating at the corner of Texas & Crawford streets at 8:00 am on Thursday, November 26th. Leaflets & signs will be provided. For more information, please contact HART's Director, Alma Williams via email or call 832-380-HART. (Alma is also a member of Society of PEACE.) You can also visit HART's website for more details on the leafleting day.